All-round ultrabook. 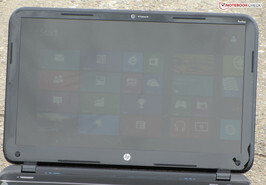 Hewlett Packard now has a slim, 15.6 inch ultrabook that even allows playing up-to-date 3D games in its product line. Storage is not an issue either owing to the large hard drive. That sounds as if HP has built the perfect laptop. Our test reveals whether the ultrabook is really compelling. Ultrabooks have been becoming increasing popular since their prices started dropping. They are very handy and even look good due to their slim and light casing. 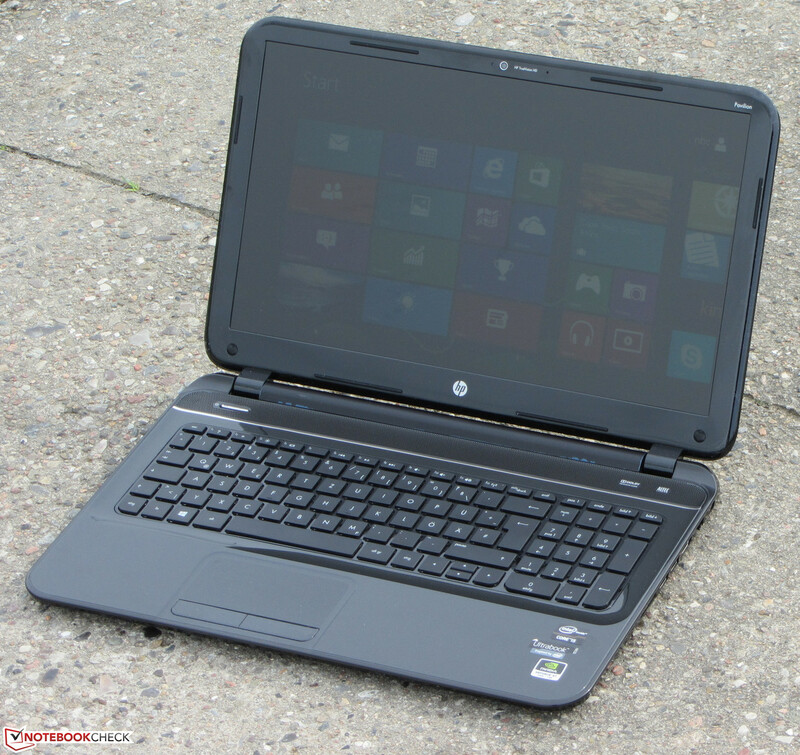 With its Pavilion Sleekbook line, HP has a range of relatively reasonably priced ultrabooks available. 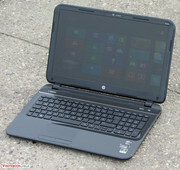 We have previously put HP's Pavilion Sleekbook 15z-b000 AMD-based model (AMD A8-4555M, Radeon HD 7600G) through its paces. The AMD model couldn't quite convince us. 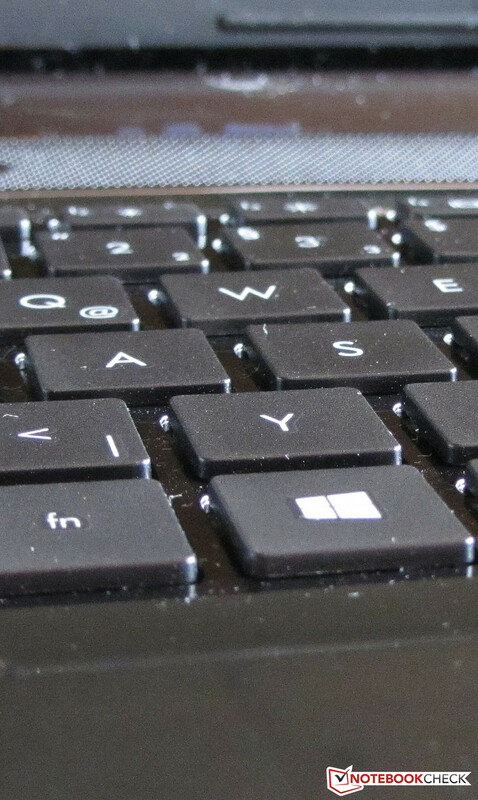 The laptop featured an inferior keyboard and exhibited a tendency for throttling. 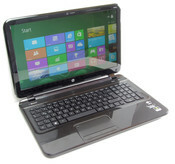 Our test will show whether the Sleekbook 15-b004sg does a better job. We used Dell's Inspiron 15z (Core i5-3317U, GeForce GT630M) and Acer's Aspire Timeline Ultra M5-581G (Core i5-3317U, GeForce GT 640M) to classify the laptop. 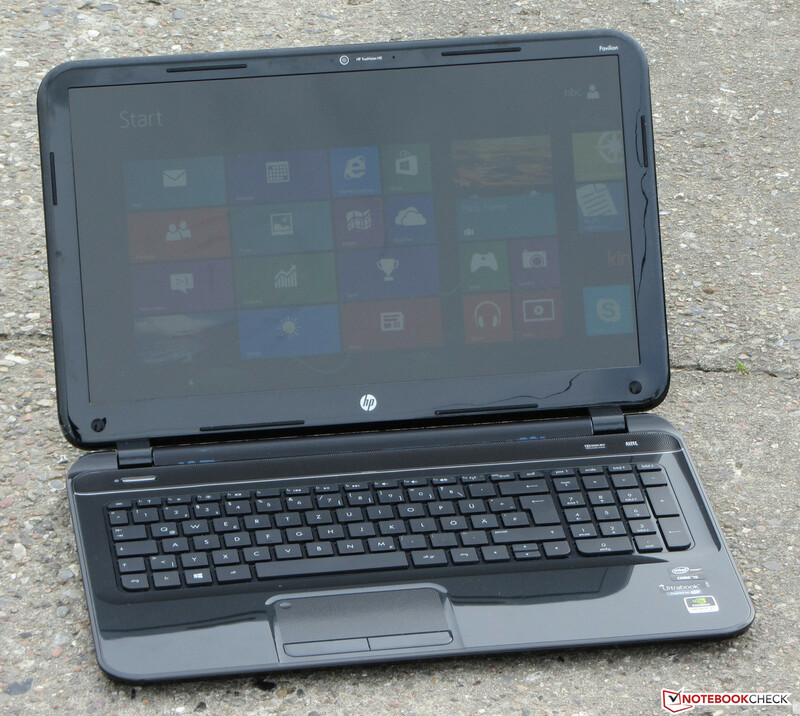 We exhaustively described the casing in the review of HP's Pavilion Sleekbook 15z-b000. Therefore, we will keep this part short. It is completely made of black, glossy plastic. HP calls this black "Sparkling Black". The base unit's stiffness is still acceptable and it makes a fairly solid impression. The lid is quite the opposite. It can be twisted very easily and image distortions are visible when pressure is applied to the lid's back. 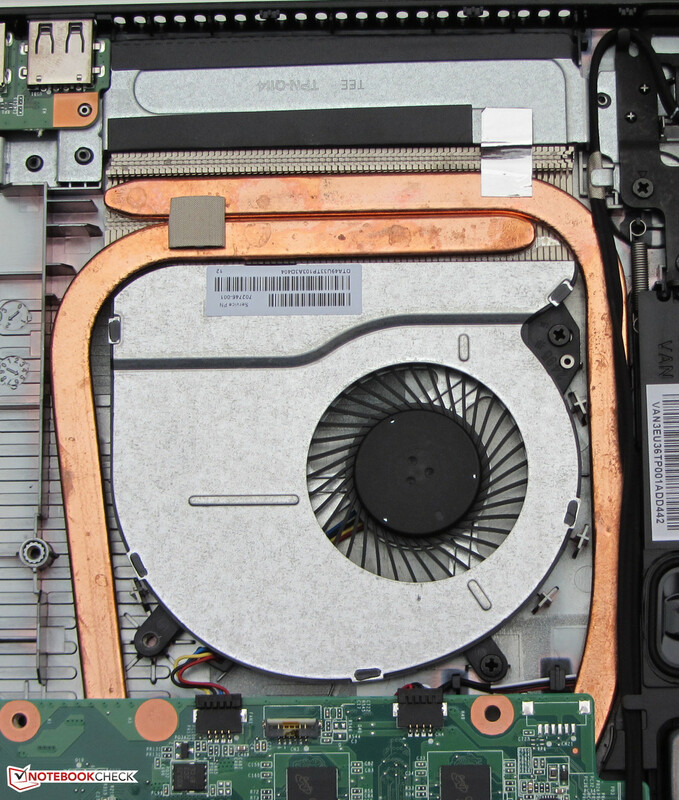 Users who value higher quality materials should take a closer look at the Inspiron and Aspire. 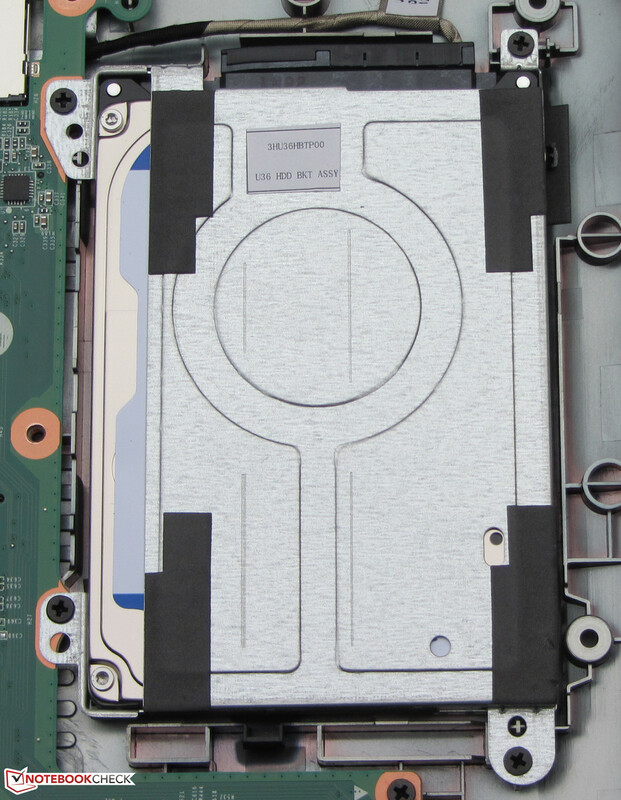 The casing of both ultrabooks is partly comprised of metal. 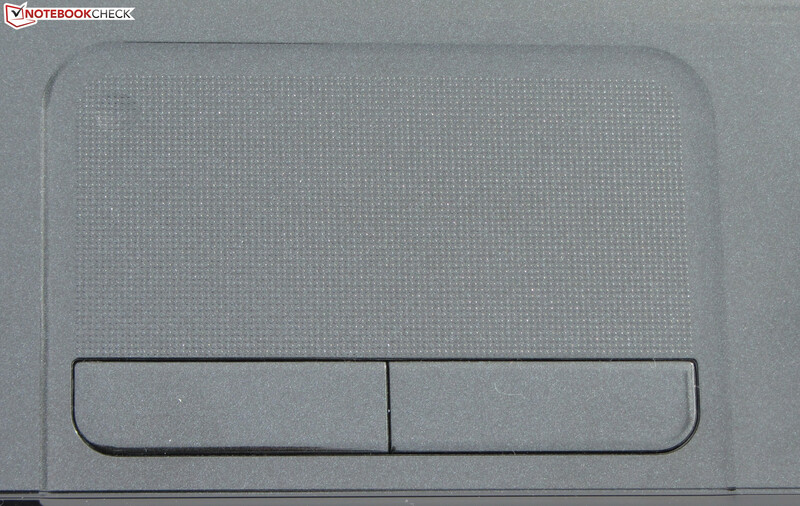 All surfaces of the ultrabook are glossy. The device is completely clad in black. All three devices feature the current interface standard. Each of the three laptops has at least two USB 3.0 ports. However, none of the ultrabooks sport a VGA out. Users who still have an old projector or external monitor without a DVI / HDMI socket could fall back on an HDMI-to-VGA adapter (from approx. 20 Euros, ~$26). The Sleekbook lags behind its contenders in two points. HP does not install an optical drive in its Sleekbook and the ultrabook only features one Fast Ethernet port. The competition comes with Gigabit Ethernet. HP has agreeably placed most interfaces in the right back area. Thus, the area beside the wrist rest remains free from cables. Left: Kensington lock slot, USB 2.0, audio combo. Right: Memory card reader (SD, MMC), 2x USB 3.0, HDMI, Ethernet, power socket. 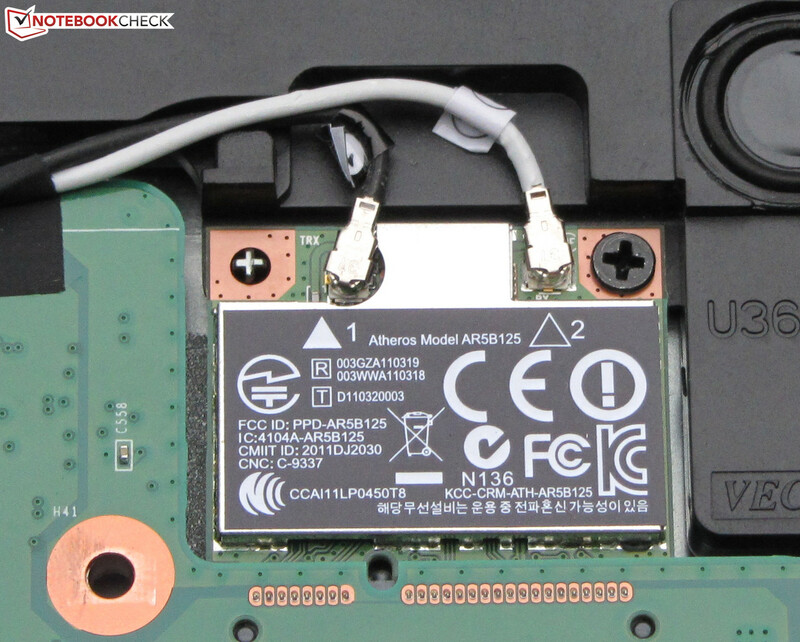 HP's ultrabook sports an Atheros Wi-Fi chip. It supports the 802.11 b/g/n Wi-Fi standards. Wi-Fi reception didn't cause any problems. The Wi-Fi signal in Windows displayed full strength both in the router's immediate vicinity (approx. 3 meters) as well as two stories below it (transmission strength: 50%). The Sleekbook is no longer up-to-date in terms of cabled networking. It only sports a Fast Ethernet chip from Realtek. Both contenders feature a Gigabit Ethernet chip, which should be today's standard. The 0.9 megapixel webcam produces a blurry picture with a resolution of up to 1280x720 pixels. Only a few thin manuals are included for the Sleekbook. The Sleekbook is delivered with Windows 8 (64-bit) preinstalled. A Windows DVD is not included. It is advisable to create recovery media via the preinstalled HP Recovery Manager. DVDs can only be used when an external burner is available. Otherwise a USB flash drive can be used. This enables reinstalling the system after, for example, exchanging the hard drive for a solid state drive. 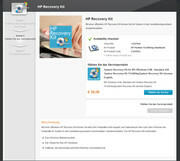 It is also possible to buy a recovery kit with DVDs directly from HP. They include all drivers and the preinstalled software besides the operating system. They are currently sold for just under 38 Euros (~$50). The recovery DVDs can be ordered on this website. 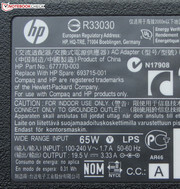 The laptop's product number, which can be found on the box, is required for this. In case of a defect, the operating system can be repaired via the Windows 8 recovery system. 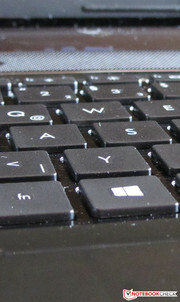 It can be opened by pressing the F11 key directly after turning on the laptop. Besides recovery, it is also possible to reset the laptop or to completely reinstall it. 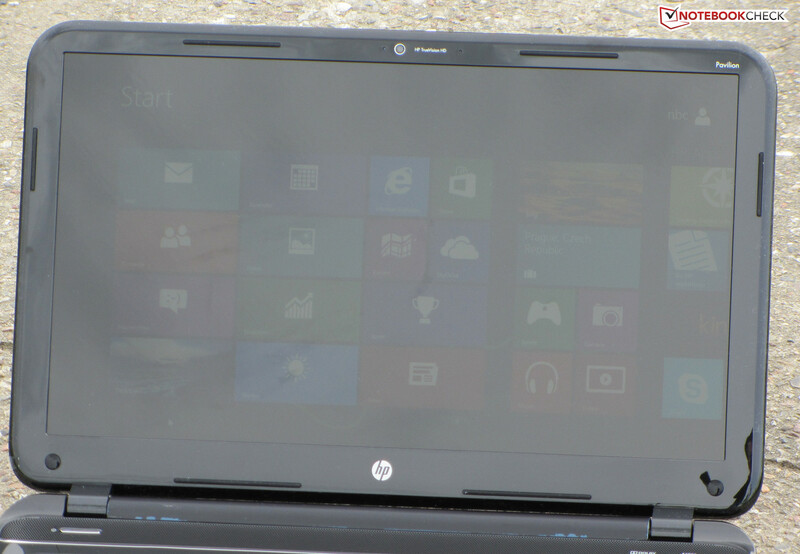 Users who prefer Windows 7 over Windows 8 will not receive support from Hewlett Packard. HP only provides Windows 8 drivers. However, it shouldn't be a problem to use Windows 7. Many drivers (e.g. the GPU drivers) are available for free. Beyond that, the Windows 8 drivers that HP provides should work under Windows 7 (for example, the Wi-Fi and LAN drivers). But: The Windows 8 installation should be backed up before deleting it so that Windows 8 can be reinstalled at any time. The Sleekbook does not belong to the most maintenance-friendly ultrabooks. 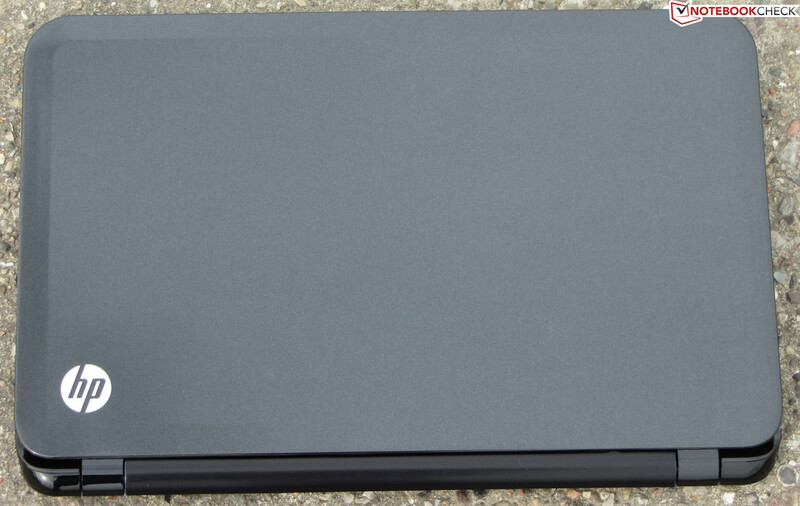 Like most ultrabooks, the Sleekbook does not have a maintenance cover. 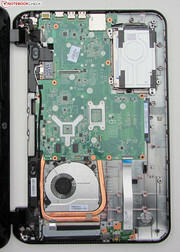 A few ultrabooks allow accessing all inner components after removing the casing's bottom. The Sleekbook gives its owner a more difficult time. The keyboard has to be removed first, which requires care. The keyboard is quite thin and correspondingly fragile. It is secured with two screws and several plastic hooks. 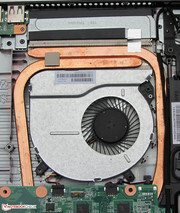 An opening is found beneath the keyboard, which enables accessing the fan. More screws have to be removed to access the innards, which are hidden underneath the keyboard. 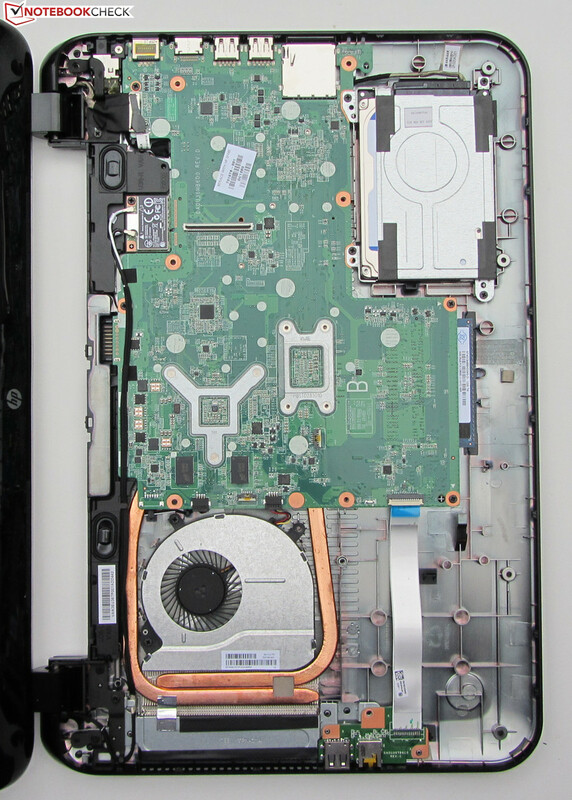 All screws on the ultrabook's bottom have to be removed after that. Then the device can be turned upright again and the base unit can be removed. Care is needed here as well because the upper tray is also kept in place with plastic hooks that can easily break. It is recommendable to carefully lift the upper tray with a plastic smoothing trowel (can be found in a home improvement center). The main circuit board's back is now visible. It is possible to access the fan and hard drive from here. The latter can be easily exchanged for another model. The main circuit board would have to be removed in order to access the SSD cache and working memory (two memory banks, both occupied, 8 GB max.). Users who want to deal more precisely with disassembling the Sleekbook can download the corresponding hardware manual from HP's website. A 12 month pick-up warranty is included on the Sleekbook. The Inspiron and Aspire come with a 24 month warranty. 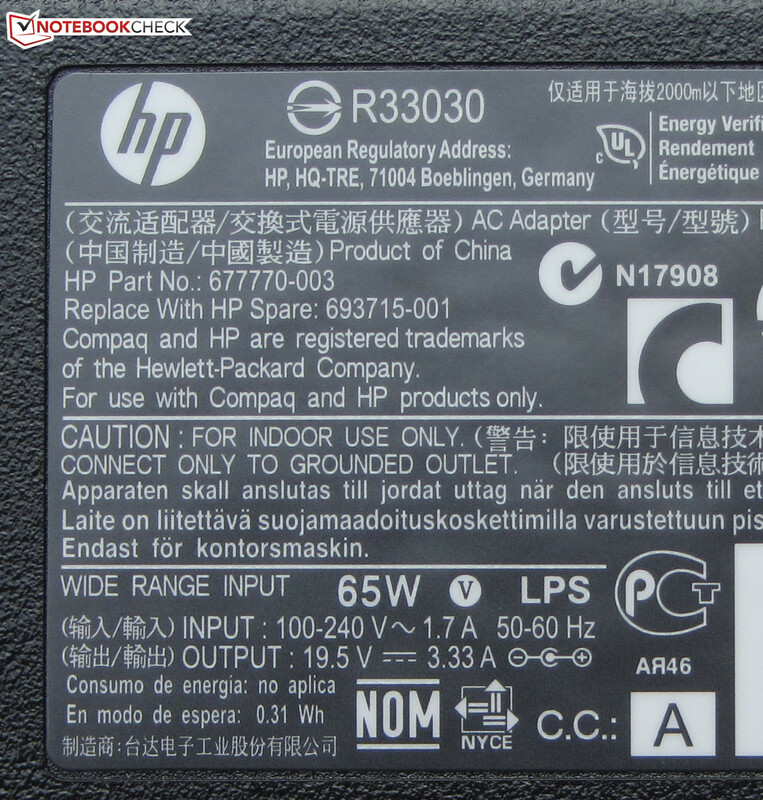 The warranty on HP's laptop can be upgraded to three years. The corresponding HP care pack costs approximately 80 to 100 Euros (~$105 to ~$132). This warranty upgrade can also be ordered with an additional accidental damage protection (e.g. against spills). In this case, about 140 to 170 Euros (~$185 to ~$224) is charged for the care pack. 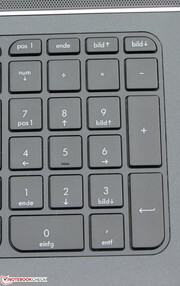 HP installs an unlit chiclet keyboard and number pad in the Sleekbook. 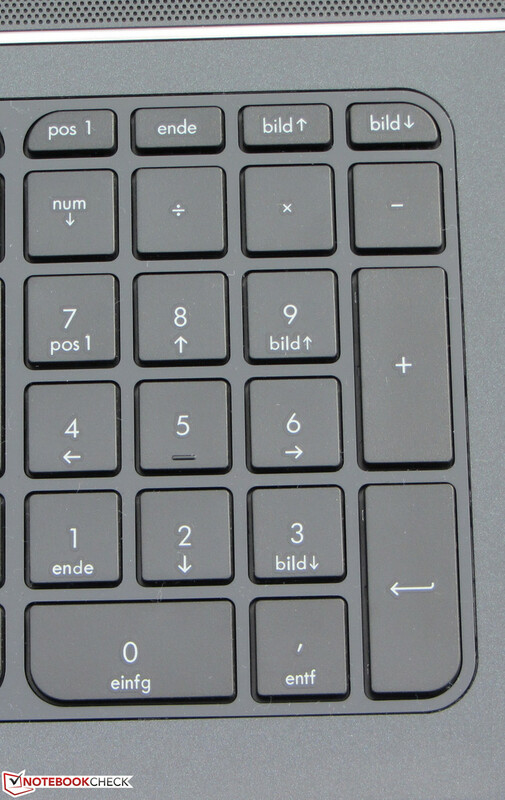 The even and sleek keys have a size of 15 x 15 mm. The keys feature a short drop and well-palpable pressure point. Only the keys' resistance could be a bit higher. The keyboard yields slightly while typing on it. We liked the installed status LEDs for Wi-Fi, caps lock and mute key. 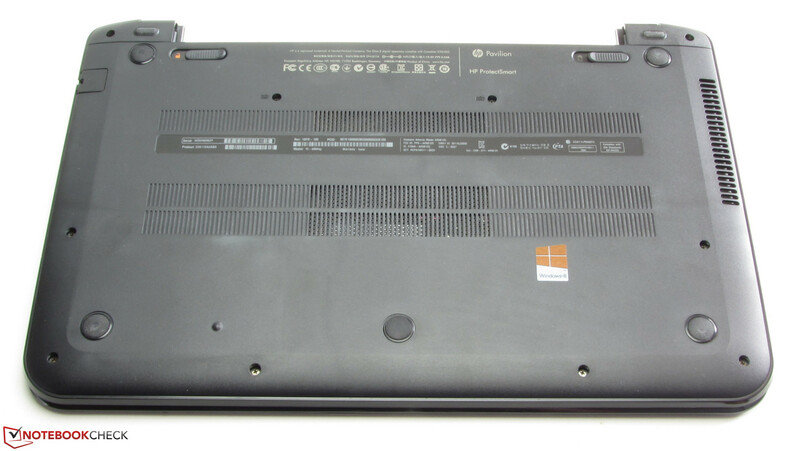 We heavily criticized the keyboard in the identical HP Pavilion Sleekbook 15z-b000 (AMD A8-4555M, Radeon HD 7600G). HP has apparently installed a different or improved keyboard in our Intel-based test model. The approximately 9.7 x 4.6 cm multi-touchpad is part of the wrist rest and has been submerged into it a bit. The dotted surface does not impair the finger from gliding. The single multi-touch gestures can be turned off or on in the system menu. Not all available gestures are enabled by default. The touchpad can be disabled and enabled via double-tapping a small recess in the upper left corner. A small LED is located just above the pad and indicates its status. Both mouse keys feature a clearly audible and palpable pressure point and short drop. HP installs a chiclet keyboard. HP installs a glossy, 15.6-inch screen in its Sleekbook 15. It has a native resolution of 1366x768 pixels. Other screen models are not available. The average brightness of 178.4 cd/m² is at most in the lower midfield. 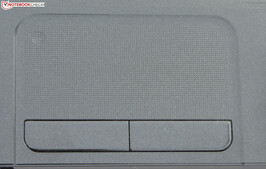 The Aspire's screen is on a similar level with 176.3 cd/m². The Inspiron 15z features a somewhat brighter screen with 201.8 cd/m². The contrast of 268:1 and black value of 0.72 cd/m² are everything but awe-inspiring. The rates of the Aspire (298:1; 0.62 cd/m²) are on a par with HP's laptop. The screen in the Inspiron 15z (650:1; 0.32 cd/m²) accomplished much better rates. 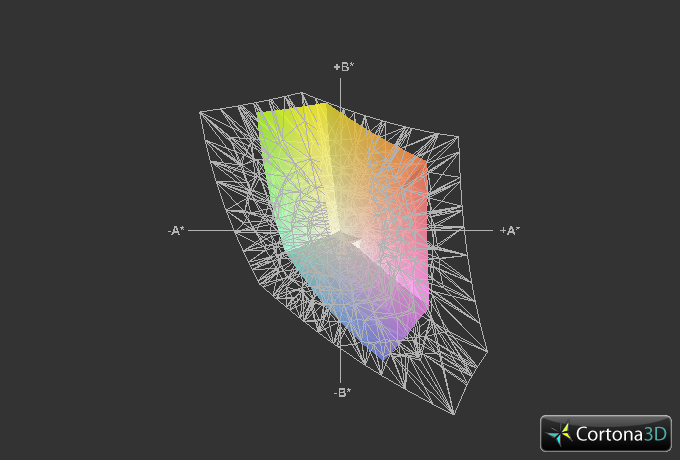 The Sleekbook cannot reproduce either the AdobeRGB or sRGB color spectrum. 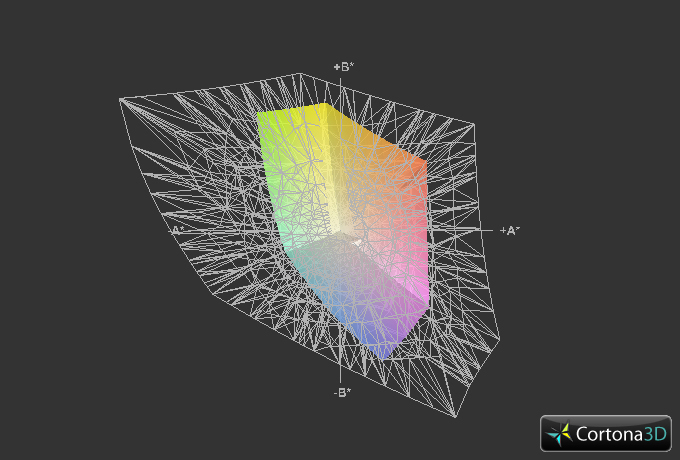 We measured the screen in its default state (target color space: sRGB). The DeltaE 2000 deviation is moderate in most colors (below or around 10). The cyan rate is higher and the screen exhibits a bluish cast. The Sleekbook is not suitable for outdoor use. The screen's brightness is not high enough to read displayed content outdoors. Also, reflections on the screen make reading in sunlight difficult. The screen's viewing angle stability is within the expected range. The image quickly deteriorates when the screen's vertical angle is changed. It is much more stable horizontally. It is possible to still recognize content up to 180 degrees from the side. However, the image darkens a bit. 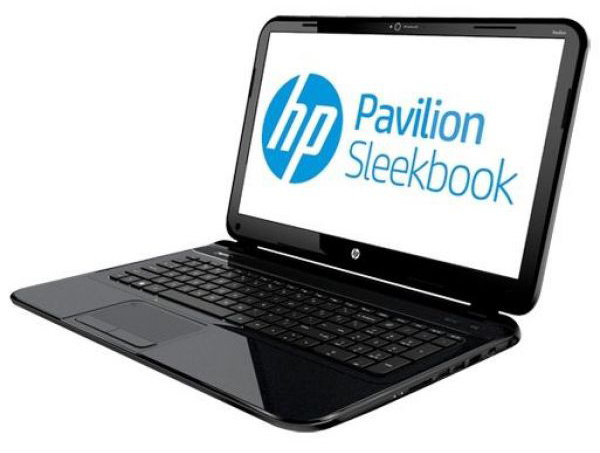 Hewlett Packard has a 15.6-inch sized, versatile laptop in its product line with the Pavilion Sleekbook 15z-b004sg, which can deal with most tasks. Internet communication, office tasks, internet browsing and rendering videos are no problem for the device. Even up-to-date computer games can be played on the ultrabook owing to the installed GeForce GPU. Our test model's price currently ranges between 500 and 700 Euros (~$660 and ~$925). 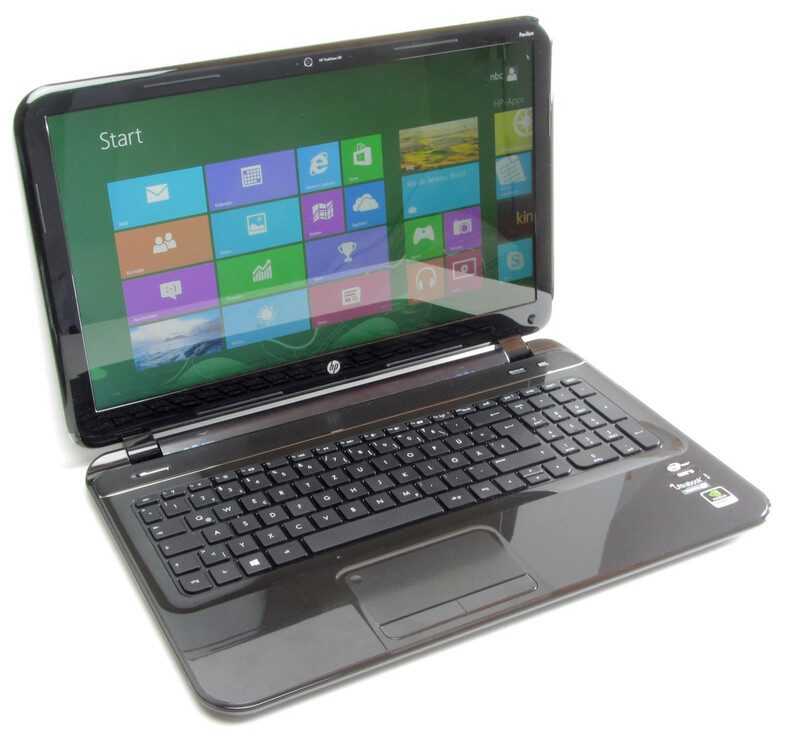 HP sells innumerable configurations within the Sleekbook 15 range. They are based on either Intel or AMD processors. Some models also feature a touchscreen. The cheapest member of the range at the time of writing was the Pavilion Sleekbook 15-b150sg (AMD A4-4355M APU, 4 GB of RAM, 500 GB hard drive) for approximately 400 Euros (~$528). The slim ultrabook sports Intel's Core i5-3317U dual-core processor. It is a member of the Ivy Bridge processor generation that runs with a default rate of 1.7 GHz. Its speed can be increased to 2.4 GHz on both cores or 2.6 GHz on only one core via Turbo. They can also operate with a lower voltage and the power consumption is thus lowered. Intel specifies a TDP of 17 watts for the Core i5. The CPU performs the Cinebench tests at full speed in both AC and battery mode (2.4 GHz). One processor core is occasionally boosted to 2.6 GHz in the single-thread tests. The Sleekbook and Aspire (Core i5-3317U, GeForce GT 640M) lag behind the competition despite the same CPU. The reason for this is that the Inspiron (Core i5-3317U, GeForce GT 630M) does not use the CPU Turbo. The Aspire has the lead in the GL tests because it features the strongest GPU. Although the Sleekbook and Inspiron both sport the same graphics core, the Inspiron lags behind HP's laptop. The graphics chip in the Inspiron does not clock at full speed either. The system runs quick and smooth. This is due to the swift SSD cache that Hewlett Packard installs. The very good scores in both PCMark benchmarks confirm this impression. 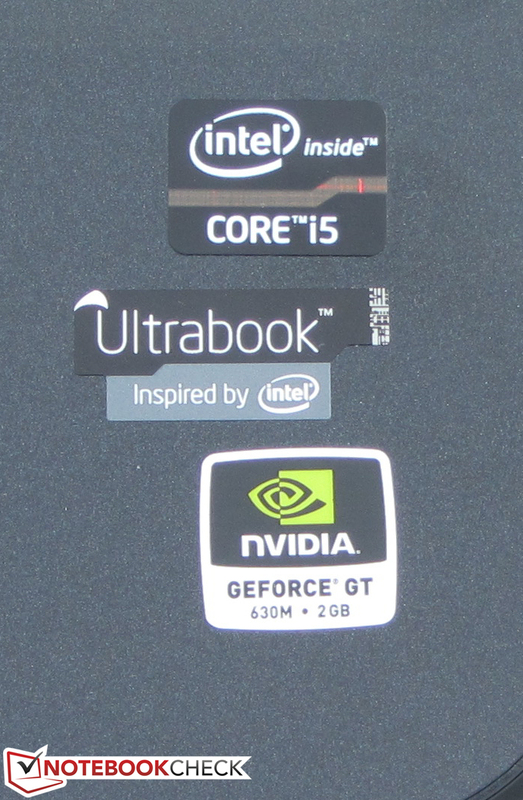 The PCMark 7 scores of the Aspire (Core i5-3317U, GeForce GT 640M) and Inspiron (Core i5-3317U, GeForce GT 630M) lag behind the Sleekbook. The Aspire also sports an SSD cache and the Inspiron even features a full-blown solid state drive. 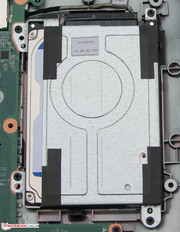 A hard drive model from Western Digital's Scorpio Blue line is installed in the Sleekbook. It has a capacity of 750 GB and runs at 5400 revolutions per minute. The hard drive is supported by a 32 GB SSD cache, which comes from LiteOn. The combination of SSD and conventional hard drive works quickly. CrystalDiskMark recorded a read rate of 224.7 MB/s. The other rates are correspondingly very good due to the cache. This also explains the high score in the PCMark 7 benchmark. 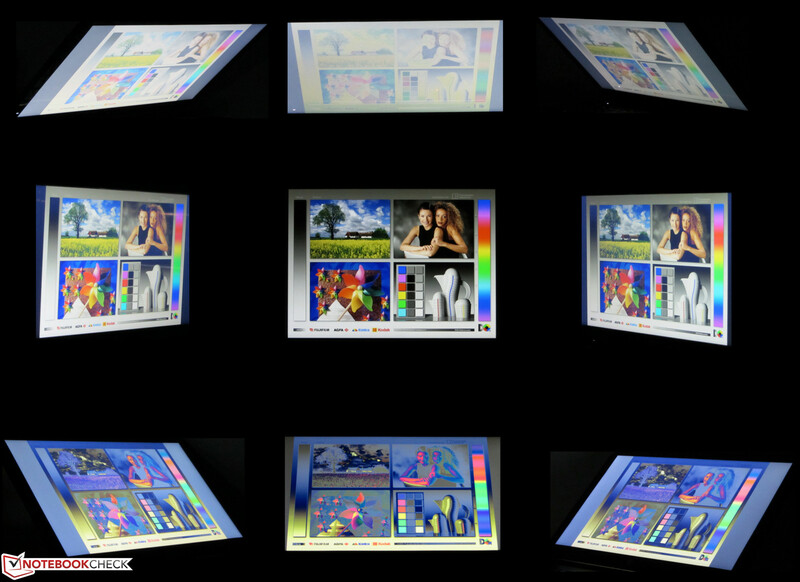 The Sleekbook features two graphics cores. First Intel's HD Graphics 4000 GPU and second the GeForce GT 630M GPU. Both chips support DirectX 11. Intel's GPU is used for routine tasks while the GeForce GPU is enabled for calculating complex applications, such as 3D computer games. The GT 630M graphics core is a member of the GPU midrange and clocks with a speed of 800 MHz. Its speed can be increased to 938 MHz via Turbo. The Sleekbook makes use of this Turbo. The scores of the different 3DMark benchmarks are at the level we expected. 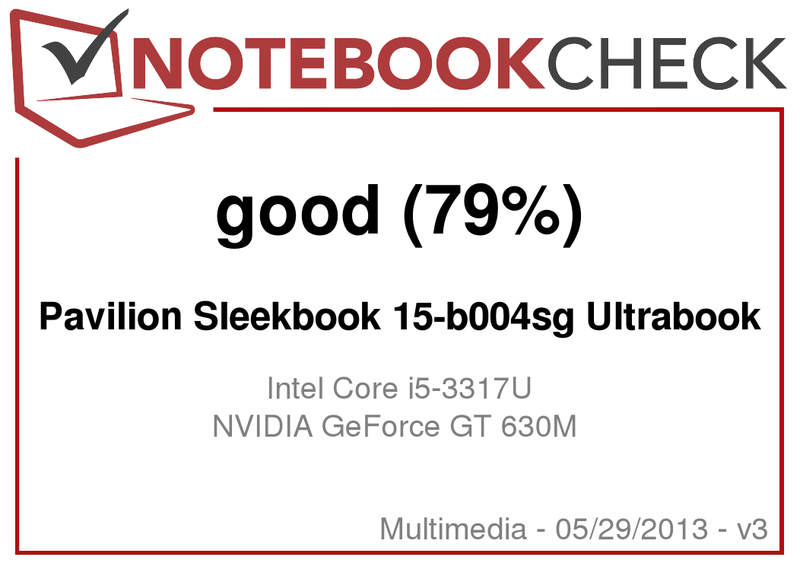 The scores of the Inspiron (Core i5-3317U, GeForce GT 630M) also lag behind the Sleekbook despite the same GPU. The Inspiron does not use the graphics core's full speed. The Aspire (Core i5-3317U, GeForce GT 640M) has the lead in all tests since it features the strongest GPU. 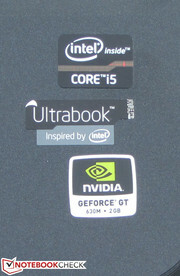 The combination of a Core i5 processor and GeForce GPU ensures that the laptop also makes a good impression in computer games. The Sleekbook can render many up-to-date 3D games in medium quality and native screen resolution (1366x768 pixels). A few games, such as F1 2012, are also rendered smoothly in high quality settings. Users who want a bit more gaming power should look closer at Acer's Aspire Timeline Ultra M5-582TG (Core i5-3317U, GeForce GT 640M). It will not be easy to find an ultrabook that features more graphics power beyond that. The Sleekbook runs very quietly in idle. We measured a noise level of 30.3 to 30.7 dB. Dell's Ultrabook produces a similar level with 29.5 to 31.6 dB. The Aspire is a bit louder with 32 to 36.3 dB. 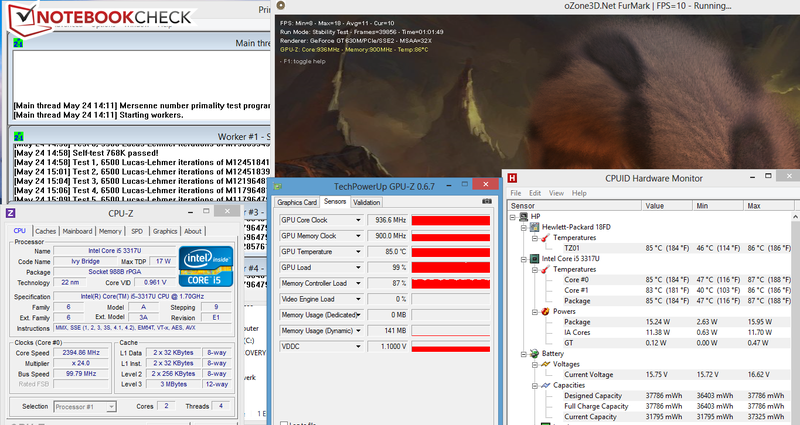 The Sleekbook gets louder in medium load via 3DMark06 and full load in the stress test via Prime95 and Furmark. We ascertained rates of 40.3 and 42.9 dB. The Inspiron (39.1 and 42.3 dB) and the Aspire (40.7 and 41.6 dB) produced somewhat lower rates. The Sleekbook in the stress test. The idle temperatures are within an acceptable range. We ascertained rates between 23.7 and 35.7 °C. The temperatures climbed to 31.4 to 48 °C during full load via Prime95 and Furmark. The idle and full load temperatures of both the Inspiron and Aspire are on a par with the Sleekbook. Both the CPU (2.4 GHz) and GPU (938 MHz) run at full speed in the stress test in AC mode, induced by running Prime95 and Furmark for at least one hour. The GPU's clock rate did not change in battery mode. However, the CPU throttles to 1 to 1.6 GHz. The CPU temperature settled to 85 °C in AC mode. The speakers are located above the keyboard behind a perforated plastic cover in the Sleekbook. They produce a thin, bass-free sound that seems a bit tinny. Connecting headphones or external speakers would be advisable for a better sound experience. The idle power consumption of 6.7 to 11.2 watts is low. The Inspiron proves to be a bit more energy-efficient with 5.9 to 9.9 watts. The Aspire's power consumption of 9.4 to 14 watts is higher. The Sleekbook's rates climb to 55 watts in medium load via 3DMark06 and 57.2 watts during full load via Prime95 and Furmark. The rates of the identically equipped Inspiron are much lower with 44.2 and 46.8 watts. However, the Inspiron's CPU and GPU do not run at full speed. The rates of 58.4 and 69.3 watts from the Aspire are unsurprisingly higher than those of the Sleekbook since it sports a stronger GPU. The Sleekbook achieved an idle runtime of 5:34 h. Both the Aspire (11:12 h) and Inspiron (7:02 h) lasted longer. We ascertained the idle runtime using Battery Eater's Reader's test. The screen is set to minimum brightness, the energy-saving mode is enabled and the wireless modules are disabled for this. The Sleekbook managed a load runtime of 1:22 h. The Inspiron only lasts marginally less with 1:12 h and the Aspire is far ahead of the competition with a runtime of 2:39 h. For this test, the brightness is set to maximum and the high-performance mode and the wireless modules are active. A full battery lasted for 2:45 h in the Wi-Fi test. Again, the runtimes of both the Inspiron (5:34 h) and Aspire (5:05 h) are considerably longer. Websites are automatically opened every 40 seconds while the energy-savings profile is active and the screen brightness is set to approximately 150 cd/m² in this test. It is no surprise that the Sleekbook has the shortest runtimes. 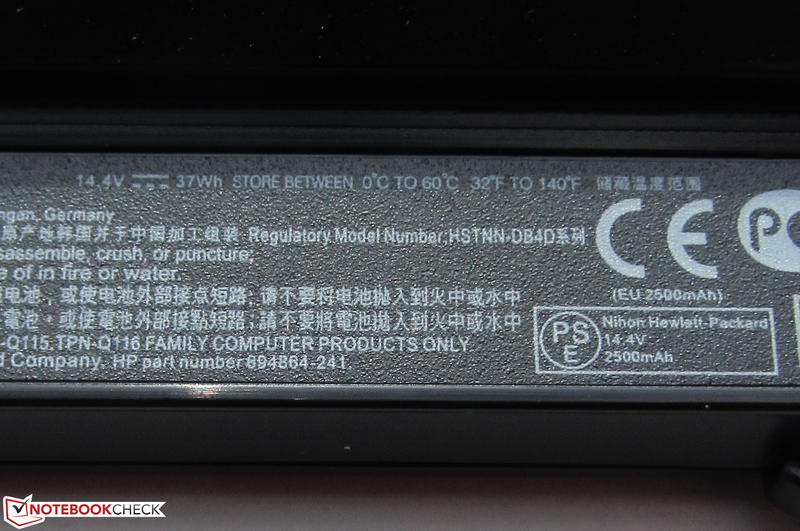 Its 37 Wh battery has the lowest capacity (Inspiron: 44.4 Wh; Aspire: 54 Wh). HP's Pavilion Sleekbook 15-b004sg offers a good application performance, runs swiftly due to the SSD cache and produces little noise, at least in idle mode. Beyond that, a generous 750 GB of storage is available and it is possible to play current computer games. However, the Sleekbook only accomplishes short runtimes due to the low-capacity battery. The dark and low-contrast screen isn't really compelling either. The buyer also has to be content with a Fast Ethernet port and live without an optical drive. Additionally, the ultrabook comes with a plastic casing. Dell's Inspiron 15z is on the same price level as the Sleekbook. Users who need an optical drive and longer battery runtimes will find a proper alternative in this device. The only drawback is that the CPU and GPU do not run with their full clock speed. Acer's Aspire Timeline Ultra M5-581TG addresses users who want even more gaming power and the longest possible battery runtimes. Its casing is also largely made of higher-quality materials in the form of an aluminum-magnesium alloy (base unit's top and lid's back). With a price of 650 Euros (~$859), the Aspire isn't much more expensive than the competition. The hinges keep the lid in position. 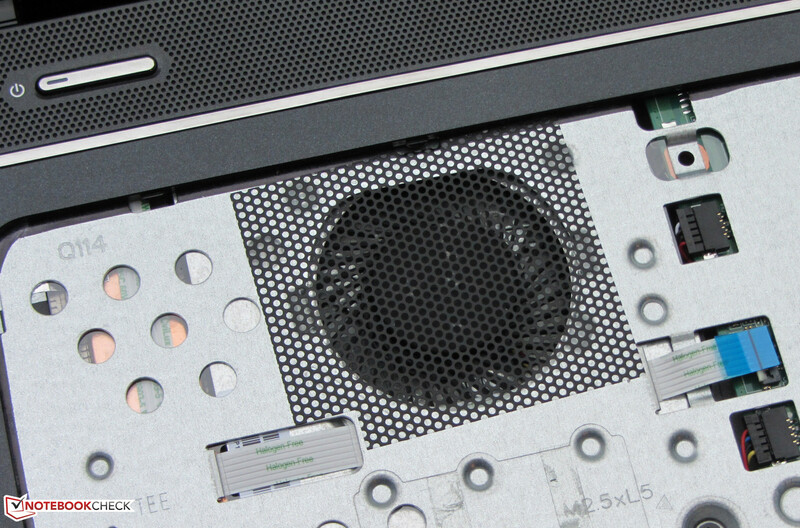 The fan can be cleaned from dust after removing the keyboard. Not all components can be accessed even after the top tray has been removed. Swapping the hard drive shouldn't be a problem. 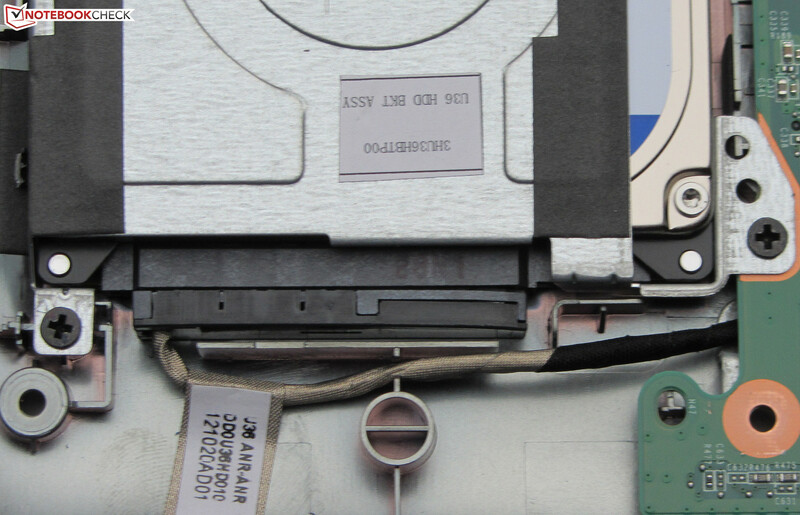 The hard drive is connected to the main circuit board by a cable. The working memory can first be accessed after removing the main circuit board. It is possible to clean the fan. ...and supplies a capacity of 37 Wh. and supplies a maximum of 65 watts. Hewlett Packard has built a gaming-capable ultrabook. 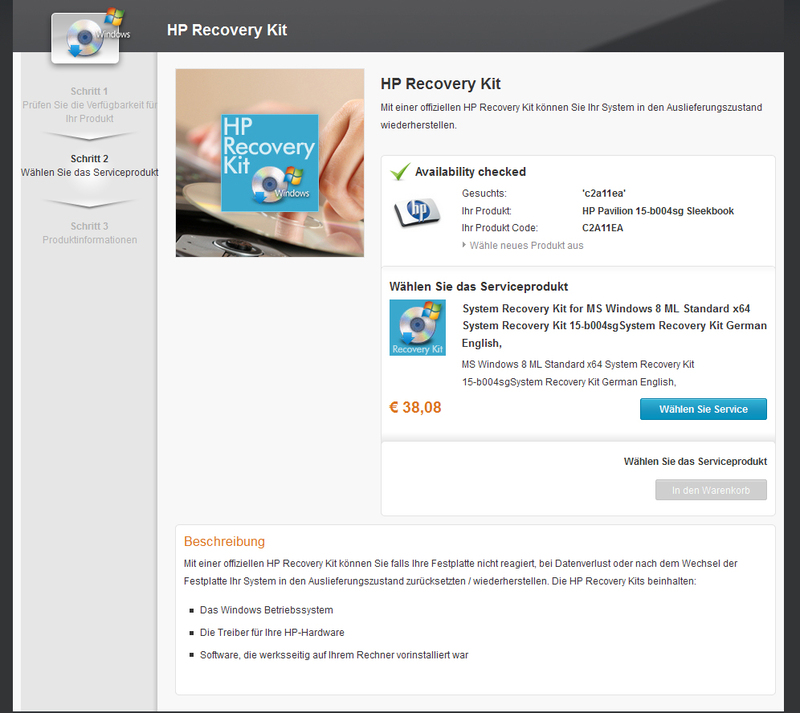 A DVD recovery kit can be bought from HP. The laptop's warranty status can be checked via HP's support tool. A brighter and higher-contrast screen. Considering the Sleekbook is an ultrabook, it has unusually short battery runtimes. This is due to the removable, low-capacity battery. Dell Inspiron 15z, Acer Aspire Timeline Ultra M5-581TG, HP Pavilion Sleekbook 15z-b000, Lenovo IdeaPad U510, Asus VivoBook S550CM-CJ038H, Acer Aspire V5-551, Acer Aspire V5-571G.